A hand hammered silver brooch by American sculptor, Alexander Calder (1898-1976). Calder, who is considered one of the foremost sculptors of the 20th century and is famous for his mobiles and stabiles, loved to make jewelry for his family and friends. In many cases, he used their initials as the basis for the design. If an image emerged from the initials, so much the better. 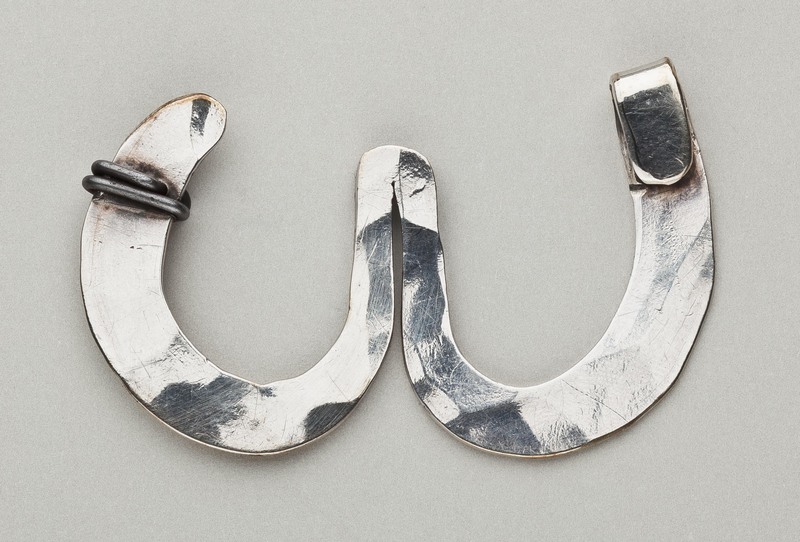 In this case, the brooch is a "U" shaped design, reminiscent of horse shoes. In reality, the brooch was made by Calder as a gift to his friend, Winifred McCulloch in 1962; hence the initials, W and M. Unsigned. Provenance: Estate of Winifred McCulloch thence to present owner, thence to Leah Gordon Antiques. A notarized letter from the executor of Winifred McCulloch's estate certifies the veracity of the provenance.